The continuation of recent protests despite the Iranian regime’s repressive measures, including mass arrests, the killing of protesters, and torture, shows that these protests have taken on a different, more resolute tone. Rather than protesting individual incidents, like the 2009 protests, the nation-wide protests that have rocked Iran since December have been directed at the regime itself and its repressive reign of terror. At the end of December 2017 and the beginning of January 2018, Iran experienced the largest national uprising since 2009. 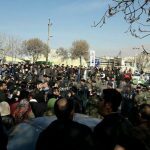 What started as localized and isolated protests in Mashhad, quickly spread to 142 cities and towns in all 31 of Iran’s provinces. Although this initial wave of disruption has ended, since January 2018, a steady stream of protests has continued to erupt across the country. In February, another wave of protests broke out in the capital over the mandatory wearing of the hijab. Then, at the beginning of April, farmers took up their shovels to protest the mismanagement of water resources, leading a fresh round of protests which have since spread to five major cities. Like the most recent farmer’s protest in Isfahan, the national uprisings in December were ignited by a triggering incident. In December, rising prices of staple food products ignited civil unrest. Also, like the most recent Isfahan protests, the triggering incident was soon marginalized, and the protests took on a more political tone, with anger and frustrations directed squarely at Rouhani’s repressive regime. This regime-targeted anger sets these most recent protests apart from their predecessors. It indicates that public appetite has shifted from temporary protests directed at individual policies, to widespread anger with the entire regime. This has been most apparent in the slogans adopted by the protestors. Protesters across the country engaged in chants of “down with Rouhani” and “down with Khamenei”, along with “Khamenei is a killer, his rule is illegitimate” and “we will fight to wrest back our country Iran.” These demonstrate the full extent of public dissatisfaction. The chants did not reflect the initial trigger of the protests; the rising price of eggs. They indicated a strong public desire for regime change, unlike anything Iran has seen before. In his article, Professor Sheehan noted that the demographic that took part in the most recent rounds of protests were also of interest. He wrote, “the overwhelming majority of those who engaged in the uprising were from poor and underprivileged backgrounds”. This is particularly damaging for the mullahs. They have always maintained that they are “the defenders of the abased”. Previous protests, like those in 2009, featured a majority middle-class demographic. However, the most recent protests indicate that both the poor and middle-classes alike are angry at the regime and there is discontent across all segments of the Iranian population. Sheehan describes how the recent protests have been effective at uniting people from all walks of life. Women, farmers, rich and poor all walked together. This also extended to ethnic unity. People from Iran’s multitude of ethnicities showed solidarity against the regime. The slogans adopted by protestors had no ethnic undertones. They showed a united Iranian population with one Iranian identity. From Kurds to Balochs, the entire spectrum of Iran’s rich population joined the protests. These protests also challenged the very heart of the clerical regime. 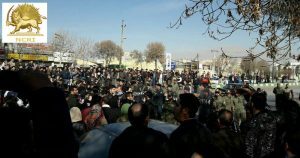 The December protests began in Mashhad and quickly spread to Qom within a matter of hours. These two cities have traditionally been regime strongholds. With discontent spreading to these “bastions of the clerical rule”, the regime must know it’s very survival is under threat. The extent of the threat to the Iranian regime from this new generation of protests is apparent in its aggressive response. The government officially states 22 protestors were killed in response to the protests. However, opposition groups, like the National Council of Resistance of Iran (NCRI), assert the figure is closer to 50. The head of the Iranian Prisons Organisation said the government arrested 4,972 protestors. Again, opposition groups have claimed that this figure is a vast understatement, putting the true number of arrested protestors at around 8,000. Although the government arrested a significant number of protestors, Sheehan suggests there were indications that the December protests stretched the regime’s military force to its limits. In 2009, the government was able to restore order through the deployment of one IRGC division to each province and two divisions to Tehran. However, the 2017/2018 protests spread too fast and were too geographically dispersed for the IRGC to immediately bring them under control. The protests raged for ten days and, according to Professor Sheehan, after the first day had “no element of surprise and all the details of the protests including locations and times were announced in advance on social media”. This indicates the IRGC was stretched beyond its capabilities. It could not prevent or stop well-advertised protests from occurring, and once they had sprung up, could not bring the situation under control for ten days. There was also chaos within the IRGC and the Basij militia. Reports of soldiers burning their membership cards and joining the protestors have emerged. This will have far-reaching consequences moving forward. The protests showed the Iranian people that the regime and its IRGC are not invincible and cannot establish control when all segments of the population protest in unison. Why are the protests gaining momentum now? The timing of the protests is also significant. The protests have evolved and become more threatening now because of the regime’s own failings. The extension of Khamenei’s control over the Iranian economy has left many individuals in conditions of financial hardship. The nuclear agreement with the US unfroze tens of billions of dollars, but the average Iranian is no better off. This is because more than 50% of Iran’s GDP is now under state control. The private sector has been marginalized, inflation is still high, and unemployment remains in double digits, particularly among Iran’s youth, which has unemployment levels of up to 50% in some areas. Nepotism and corruption are strangling social mobility. Graduates from the country’s top universities are performing manual labor and washing dishes, while the children of the country’s elite secure the top jobs. The regime’s spending has also left many communities deprived of basic social needs. Iran’s healthcare spending is approximately a third of its military spending. Tehran has prioritized spending on foreign military and extremist groups overspending on the basic social needs of its population. The regime has created the discontent that has fuelled these anti-government protests by neglecting its population. Beyond neglecting its population, the regime has extorted money from them through manipulation and deceit. The regime lured middle and lower-income Iranian people into investing in government institutions under the promise of high investment returns. These investments were embezzled into Rouhani’s regime, leaving the institutions bankrupt and many Iranian’s without their life savings. The regime’s deceit impacted a large segment of the population and has contributed to the discontent of a large segment of the Iranian population. The economy shows no sign of improving, and in many parts, could get a lot worse. The regime’s looting of Iran’s financial institutions means that several principal banks face imminent bankruptcy. Should these banks bottom out, more of the Iranian population will find themselves without their savings, looking to vent their frustrations at the regime that left them penniless. Increased connectivity and mobile penetration have also contributed to the evolution of the Iranian protest movement and the emergence of a new breed of protest. The movement is more organized and efficient. Half of the Iranian population now uses the instant messaging service, Telegram. It was essential in facilitating the mobilization of the population in the December and January protests and in the coordination and spread of civil unrest. In his report, Prof. Sheehan discusses another reason for the increased momentum and success of the public protests in Iran, which is the presence of an organized and structured opposition movement. He emphasized that leaderless movements are easier to curb and eradicate through the use of government intimidation and oppression. “The People’s Mujahedin Organisation of Iran (MEK), lead by Maryam Rajavi, has been a lightning rod for opponents to the Iranian regime”. The MEK’s continued presence in Iran helps mobilize and inspire the population into organized resistance. The MEK has also played an integral role in bringing the full extent of the regime’s atrocities to light. It has worked tirelessly to shed light on the regime’s massacre of 30,000 political prisoners in 1988 and the officials involved. It also exposed the location of nuclear weapons research facilities and the progress of the regimes nuclear weapon development program. Without the MEK, the full extent of the regime’s atrocities and crimes may never have been exposed to the Iranian public. It provides a constant voice for the opposition and a beacon for the nation’s youth who are dissatisfied with the status quo and eager to be a part of the opposition. Prof. Sheehan reiterates that the MEK has played a key role and been a driving force behind the spread of recent protest movements. It is one of the few organizations that provides comprehensive coverage of the protests, broadcasting video clips and giving interviews to international media outlets. Its coverage of the protests undoubtedly contributed to the spread of the protests and will be a driving force in the re-emergence of protests in the near future. Not only did the December and January protests represent a new dawn for Iranian opposition, but they also represented a new dawn in international attitudes towards the Iranian regime. Before the protests, Prof. Sheehan describes how the prevailing thought in the west and among international leaders was that the Iranian poor supported the regime. They believed Tehran had effectively suppressed the opposition and enjoyed unrivalled dominance and control over the population. The west also believed the easing of economic sanctions would provide a cash windfall for the Iranian people and reduce their appetite for dissent. In the wake of these ground-breaking developments, Sheehan asserts that we may see an increasingly firmer stance taken by the international community, particularly from the Trump administration. The MEK in opposition will continue to work tirelessly to organize outlets for the disheartened population to vent their frustrations. The MEK has supported the establishment of secret centers of resistance which will connect like-minded protestors and attempt to orchestrate the downfall of the repressive regime. This platform of an organized opposition taking practical steps towards regime change provides the Iranian population with the best possible chance of success. It puts the mullahs and Rouhani in the difficult position where they have no option but carry out widespread reforms or face the collapse of their regime under the weight of public discontent. Given Rouhani’s reluctance to reform, we can conclude that protests will continue and intensify. Prof. Sheehan’s article vividly depicts the changing Iranian political landscape. It demonstrates that is has been irreversibly altered by the December and January protests. The regime cannot afford to continue with its repressive ways without acknowledging public frustrations. The next wave of protests will be louder, larger and more powerful and the regime will soon be unable to maintain a grip on power. Last year, Maryam Rajavi summed it up. She told a crowd gathered in Paris that “the light of change is shining on Iran.” These protests have shown the world that light and demonstrated that the Iranian regime is staring down the barrel of collapse.